March 9, 2008 - Finished the bathrooms. The 2nd Master Bath has the green shower tile. Mud Room - July 2008 - This bath is in the basement, very close to the back entrance in the garage. 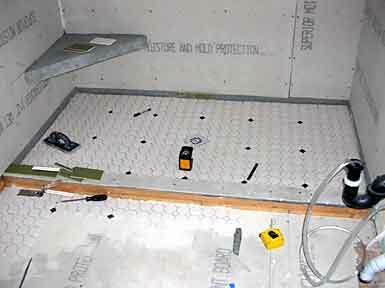 We created a shower with a flush floor entrance, there is no step or barrier between the shower and bath floor. The floor is concrete that we sanded, stained, and sealed. July 2008 - Half bath. 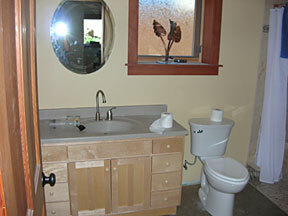 We reused the sink and toilet from the original house. February 1, 2008 - Gary is working on the tile in the bathrooms. Below is the 1/2 bath. 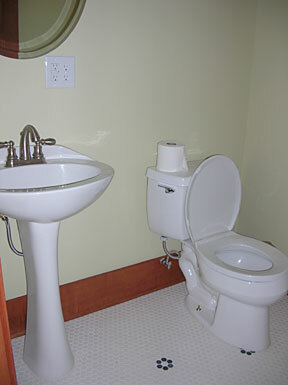 The powder room (above) or sometimes called 1/2 bath is done. The tile is the same that we used in the Master Bath. 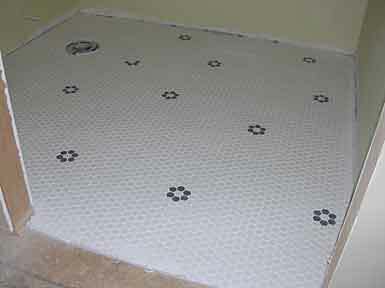 It is a 6-sided white tile on a 12 inch mesh backed surface. He pulled out the white tiles and replaced with black to create the rosettes. 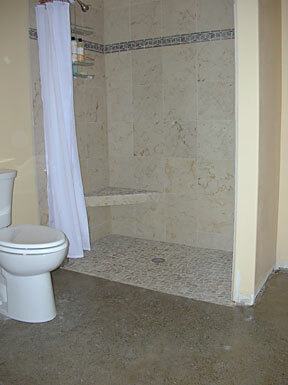 The second master bath (above) tile is slightly different than the powder room. The tiles are 8 sided and 2 inches wide with 1 inch square tiles between the 8 sided ones. 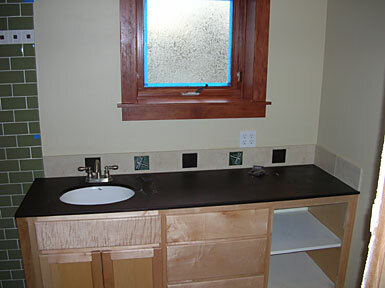 Gary placed a 1 inch tile made of the PaperStone counter top every 12 inches to create the accent. The seat is made of aluminum, filled with mortar, about 30 inches across the long edge. 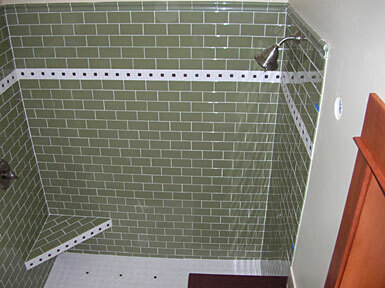 The walls of the shower will be in green tiles.